Can’t sleep? We’ve all been there. With the Cradling Sleeper, however, you can stop counting sheep and get the relaxing sleep you deserve. The Cradling Sleeper is a patent-pending, ergonomically molded foam side sleeping cushion that is designed to relieve shoulder pressure and align the spine. The cushion is superior to standard pillows because it elevates the torso, providing unique support in a compact form. While most side sleeping pillows are oversized and quickly lose their contour, the Cradling Sleeper is easy to travel with and crafted out of high quality molded polyurethane foam. 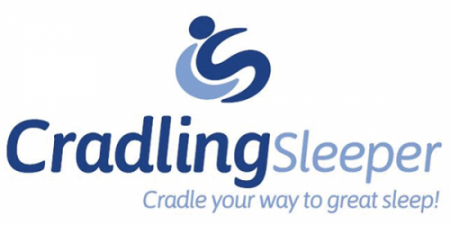 CradlingSleeper is committed to providing customers with innovative alternatives for better sleep. Founder and Navy Submariner Steve Whear has experienced first-hand the exhaustion that results from sleepless nights; during his service it was a continual challenge to get comfortable sleep. In a moment of frustration, he carved a piece of seat-cushion to ease his shoulder and back pain – and the Cradling Sleeper was created! Customers of the Cradling Sleeper continually give enthusiastic reviews of the product, and Fitbit data has indicated that surveyed customers have experienced as much as a 20% increase in sleep quality. We all know what a difference a good night’s sleep can make, so before you go mattress shopping – try the Cradling Sleeper and give yourself the sleep of your dreams!